Have you noticed that within less than an hour after your kid has stuffed his/her face with a delightful sweet treat i.e. birthday cake, donut, a bag of gummie bears, there is a tantrum? And it tends to be ugly. You were hoping for a nice time at a party, in town, playground or a walk, especially given that your offspring was rewarded with that thing that is always at the back of their mind: SUGAR. So how come that within what seems like a blink, you have to deal with some kind of screaming monster, that has taken over your child. Crying for no reason, screaming for no reason, moaning for no reason. And no reason actually works with him/her. How come? Especially that you have had their sweet treat! Yes. Now have a look at the last two words of the previous sentence. And you will find your reason. A bit of science and it will all make sense. Logical? Well, yes it is, but what can we do about it? 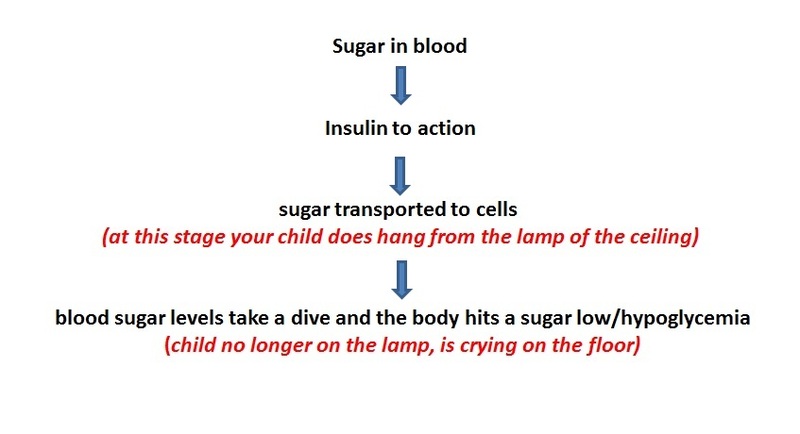 I wish saying that not feeding sugar to children would solve the problem. Well, actually it would but if we deprive our kids of birthday parties and other social sugar related events, we might create trauma for life, which long term might be worse. My trick is to feed my child before she falls of the lamp. Yes, sounds crazy to give proper food to a person who has just demolished a piece of chocolate cake, but it works. Previous Cancer – How to keep the thief out?